A female (birthdate 1948) was operated in 1995 because of the hip arthritis - THA (Phoenix). 1997 - revision THA with a cement Beznoska (the images attached). Recent weeks she marked pain in the femur and instability - xrays revealed stem migration and shaft fracture. If a revision implant with super-long stem is not available, what plan is optimal? At the moment they plan to remove implant, cement, perform bone grafting of the proximal femoral end and nailing, and after healing of the shaft - nail removal and conventional revision THA. The other hip joint is OK.
Any comments/ideas? THX in advance. Looking at the images your patient has an eggshell like bone filled with cement and prosthesis in the upper half. A longer stem would eventually land in a distal fracture, I feel. After you do removal of components, nailing and bone grafting why don't you keep her on traction and treat like an excision arthroplasty. This could be lesser of the evils. (Already two hip surgeries with one revision and one shaft fracture in seven years at the age of 54 years). An interesting problem for Surgeons from less developed countries since we can't go on revising hips forever due to non availability of components and economics. 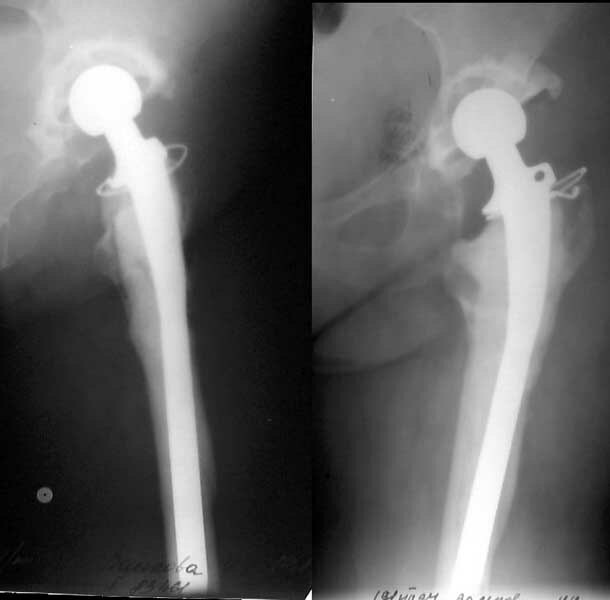 (1) remove implants and cement, get samples, leave antibiotic cement probably shaped like a hemiarthroplasty to prevent shortening and to allow some movement at the hip. Change antibiotics if needed according to culture report. Exfix the fracture. 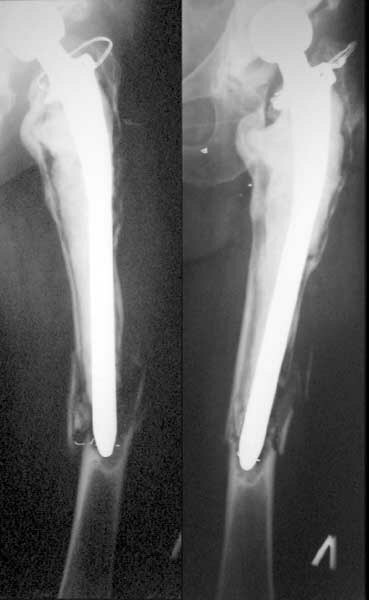 (2) once any infection is controlled, do an impaction grafting to regain proximal bone stock and a longer stemmed prosthesis seems to be a good option. Wouldn't really think it was an easy case, though ! The hip may be infected, in which case all the previous answers may apply. If during operation there is no infection, I wonder if you could remove the stem, insert a new shorter one with cement, apply a wave plate from the proximal cement to the distal femur and graft the part in the middle?